Click on photo to see the village and surrounding areas. For decades, Colorado’s spectacular mountain scenery and lovely summer temperatures have lured vacationers to the lakeside community of Grand Lake. One of Colorado’s first resort communities, Grand Lake is home to a variety of year-round activities offered in a rustic mountain setting. The mountain village of Grand Lake, wedged between the western boundary of Rocky Mountain National Park and the shores of Grand Lake, developed as a result of gold prospecting along the Colorado River, the same one that carved the Grand Canyon; it begins right here! about this glacier-carved body of water – the largest natural lake in the State of Colorado! The discovery of gold along the Colorado River in 1879 brought prospectors into the area and by the end of that year, Grand Lake had a hotel, general store, and a sawmill. The short-lived gold boom ended four years later in 1883 and Grand Lake’s population declined. However, the community began to prosper again near the turn of the century as word spread of the area’s plentiful hunting and fishing opportunities. By 1902, the area was attracting wealthy families from Colorado and other states who built summer homes along the shores of the lake. The creation of Rocky Mountain National Park in 1915 secured Grand Lake’s future as a gateway to the Park. Tourism received an additional boost in 1952 when Colorado’s Big Thompson project was dedicated, creating more recreational opportunities at the new Shadow Mountain Lake and Lake Granby. Wake-boarding/speed boats and jet skis are permitted here, although not on all mountain lakes. 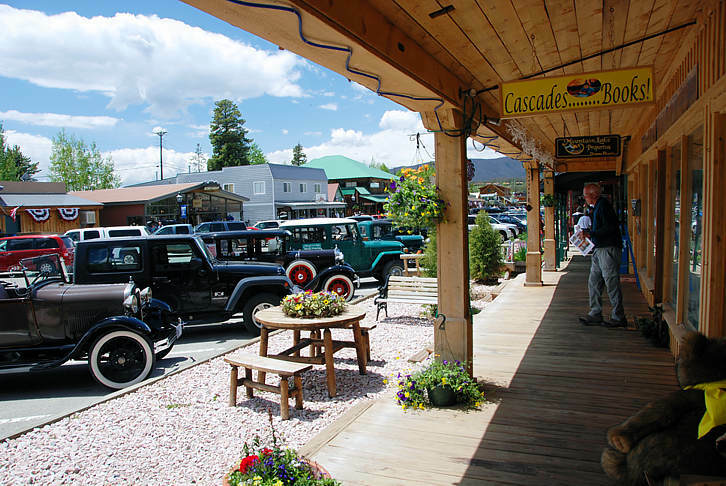 Today, wooden boardwalks and western-styled storefronts line both sides of Grand Avenue, lending a casual mountain ambiance to the village. The village snuggles along the shores of its namesake. Grand Lake is one of the state’s most beautiful lakes and is surrounded by a steep forested shoreline dotted with rough-hewn summer cabins and homes, some of which date back to the turn of the last century. Visitors to the area can get a feel for what it was like to live in Grand Lake during the early 1900’s with the historic walking tour. Our office can provide you with the self-guided tour booklet developed by the Grand Lake Area Historical Society; it includes over 16 sites. The tour also takes you to locations such as the Grand Lake Yacht Club (the highest registered yacht anchorage in the world) to the Kauffman House (one of the last of several lakeside hotels that served early tourists in the Grand Lake area (starting in 1892). History books are available at the Kauffman House. Grand Lake serves as the western gateway of Rocky Mountain National Park and the headwaters for the Colorado River. For more information about Grand Lake, including a free vacation guide, visit the Chamber website at www.grandlakechamber.com or call them: 970-627-3402.